Rock Shocks have a long history in off road competition with success in all branches of the sport dating back to 1976. The first Rock Shocks made their debut at the Scottish Six Day Trial. Every rider using Rock Shocks finished the event. As a result of the modifications made from the lessons learned at the SSDT Rock Shocks began to dominate trials in the 1980’s. Almost every British National Solo and Sidecar Trial Championship, including Schoolboy A & B held in 1980, 81, 82, 83, and 84 was won on Rock Shocks. The new alloy bodied Rock Shocks feature 12mm piston rods, improved internal adjustable damping characteristics, hydraulic cushioning and extended top and bottom mounts. 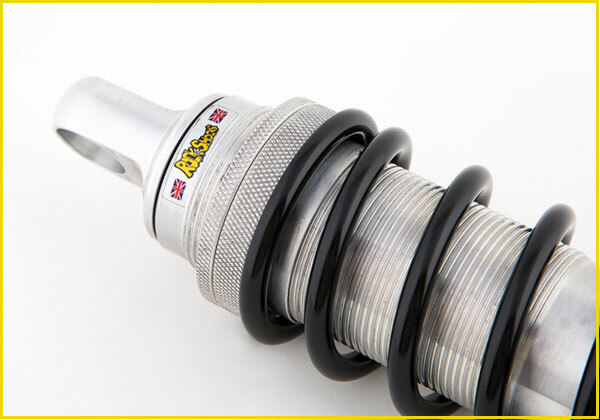 Rock Shocks are available in lengths between 220mm to 425mm (8.5″ to 16.75″) with bushes to suit most bikes. An enormous advantage for the rider is that Rock Shocks are fully re-buildable. Gary Fleckney took over ownership of Rock Shocks in February 2013 from John Bull. Since then Gary has expanded the business through the development of new products. Gary himself has a hydraulic engineering background and has been an enthusiastic competitor since the 1970’s and can be seen competing across the UK and Europe while testing and promoting the products. The development of our products is based on our own testing of the shocks alongside the importance of listening to our customers. This is how the larger bodied shock came about, when some of the harder charging riders on larger machines such as Tribsa, Metisse, Cheney and CCMs requested consistent damping for the more modern tracks and longer races. Most recently, due to growing requests, we have started to offer amodising to the aluminium components and also an option of chrome or black springs. In addition to the above, monoshocks for air Air Cooled Mono’s were launched in 2016 after development work throughout 2015 and the range continues to grow. The first monoshocks had instant success in the air cooled mono championships. Fork springs were launched in 2017 in answer to cusotmer demand, with the range of Rock Shocks products continuing to expand. Rock Shocks are now being used around the World from Australia to the USA on bikes from AJS to Yamaha in all forms of competition. As time has gone on we have expanded into classic scrambles, enduros, road, road racing and in fact even trials cars, quads, sidecars and aeroplanes. Rock Shocks also undertakes commissions for specials. 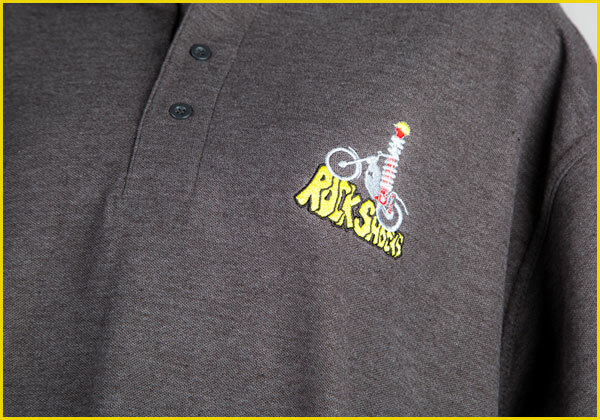 We now have a wide range of merchandise ranging from riding jackets and sweatshirts (all of which can be personalised) to hats and other useful rider accessories. Massive thanks to Rockshocks! The shockers are amazing and perform like a dream! Hats off to Rockshocks! ... Thanks again for your input and thoughtfulness it is much appreciated in a world where good old-fashioned customer service is slipping away. Received the parts today many thanks for a quick service and can I just say what a delight it was to build these. They must be one of the best put together shocks I have dealt with. 7 years old and 8 British Championships later and never touched them - insides were as good as new, Sorry will check them every few races from now on !! I just wanted to let you know that the shocks you provided have transformed the rear suspension on the HT5. Smooth, plush and, almost, a pleasure to ride in these Yorkshire streams! Just to thank you for your great service. Fitted the Shocks today and they are superb. It is a pleasure to do business. Many thanks. 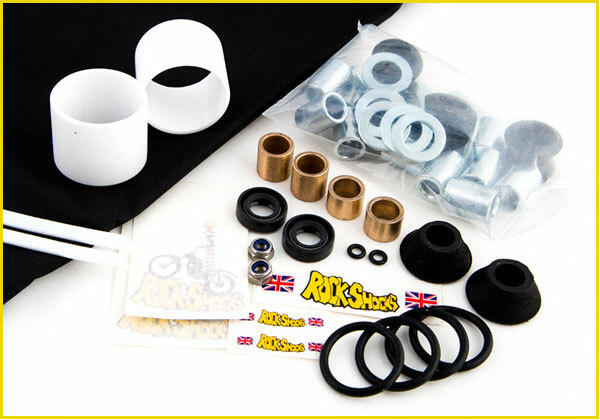 Classic Competition Components In our opinion Gary Fleckney Rockshocks are the best shocks out there. #British #rebuildable #Greatdesign #reliable #workwell - perfect partner for our frames. The Jap Metisse boys certainly won the plaudits beautiful to watch and listen too ,as were Team JME CCM who won all four pre 75 races on the Saturday on Rockshocks too ? A win win situation. The winners of the KIA Championship classes 2016 including Rock Shocks users Colin Ward, Colin Ward Junior, Mark Stokes and Paul Norman. Well done to everybody involved in the series. Superb three weeks riding on Rock Shocks with three event podiums 3rd Caglio Italy, 1st Lyonffans France, 2nd Aywaille Belgium. Rock Shocks working well at the weekend !!!!!! Forget Swedish gold get some British gold fitted. Well not a bad result in the end at Priddy, beat Barry Barthorrpe by one to get 1st place - another Rock Shocks win! So happy with the new shocks, thanks to Gary Fleckney form Rockshocks. Having some good rides Gary must be that Mono Rockshock can't believe it's ability alone !! Just a quick line to say what a brilliant set of shocks ... they have transformed my bike from sitting on a park bench to sitting in my favourite arm chair. Your quality at Rockshocks is already well known around the north east circuit, but you now have yet another advocate of your product singing its praises to other would be customers up here. Cheers! ... the bike went really well after the complete re-build as I only finished it at 11pm last night .... finished the whole lot with my best ever mark. The shocks were really good, such a difference over the ones I took off. Just got our shocks Gary, looks fabulous! Very much appreciated craftsmanship and service - a true gentleman. Thanks for your excellent service. Shocks arrived according to plan and looks great. There is engine building to do and other things, so testing in a couple of weeks. Can’t wait for that! Fitted my new shocks you supplied me to my Beamish and it transforms the handling amazingly. Tried the Cheney last night - wow what a difference with the new shocks! Hi Gary - Thanks for the advice - reducing the spring rate improved the ride on Sunday at the Mortimer Classic ! "I have put Rockshocks on my Metisse and it has transformed the bike - absolutely fantastic"
"Hi Gary, I tried the shocks out last night..,.what a difference, it feels like a modern bike now. Really impressed!" "Can't wait to get the shocks on. Thanks again for all the help and quick turn around"
"Got the four sets of shocks ..... they look fabulous"
"Thanks for the super service and trust"
All the champions that win using Rock Shocks can’t be wrong…..!! We only use the best quality components in Rock Shocks, giving you reliability, handling and the ride quality you need to compete with the best. We will build and set up your shock so it is perfect for you…. just talk to us and we will make it happen. There is nothing worse than not being able to get hold of the bits you need…. when you need them…… all our spares are only a day away from your door. Dates for your 2019 DiaryRockshocks will be out and about this year and we look forward to meeting with all our customers (new and old) throughout the year. Rockshocks will be attending and sponsoring even ..
Last call pre-orders for Telford ! !Just a reminder that this Friday, 1 February is the cut-off date for pre-orders for Telford for shocks. If you get your order in to us by or before 1st February, you will be able t ..
Pre-Orders for Telford 2019It seems incredible, but it is that time of year again and Rock Shocks Central is in full Telford Preparation mode! As many of you will know, in previous years we have done Show Of ..
Last Orders before Christmas !I know it may seem a little early, but this is just to advise all our lovely customers – new and old – that the date for last orders of both Rockshocks and Rockshocks p ..